A group of Bronxites want to hold a public hearing on two power plants in the South Bronx. PORT MORRIS — A group of South Bronx activists want to see a pair of power plants along the waterfront leave their borough to make room for fresher air and recreational use. The Harlem River Yards plants, located at 688 E. 132nd St. by the Robert F. Kennedy Bridge, want to renew two environmental permits that are necessary for them to operate, and Bronxites want to use this as an opportunity to hold a public hearing on the facilities that they hope could wind up shutting them down for good. The plants were installed about 15 years ago, and they were not meant to be permanent, according to an online petition advocating for them to be shut down. "It was supposed to be a temporary installation," said Mychal Johnson, a longtime South Bronx environmental advocate who is supporting the effort. "So I think 15 years is long enough." The petition, which launched on Wednesday, already has 1,326 supporters and urges people to send comments to the Department of Environmental Conservation to demonstrate the necessity for a public hearing about permit renewals for the plants. People must get their comments to the DEC by Sept. 4, but advocates have already achieved their goal of sending the agency 100 comments, according to Harry Bubbins, a founder of the environmental group Friends of Brook Park. "We're happy to announce that after just one day of launching the campaign, we’ve already gotten over 100 comments to them," he said, "so I think they’re going to be compelled to do the right legal thing and hold a public hearing." This hearing would allow residents to learn more about the plants and why they are not being subjected to harsher scrutiny, Johnson said. "We also want, of course, it not to be re-permitted, so some of the harmful things that have happened in this community for decades can start going in the other direction," he said, maintaining that the plants' removal could open up more opportunities for fresher air and waterfront parks. 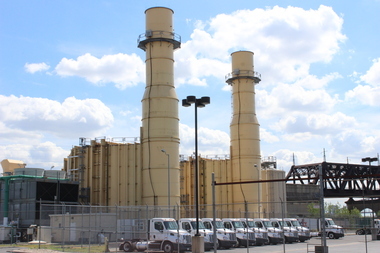 The pending opening of the nearby Randall's Island Connector helped inspire the petition as well, as activists argue that it does not make sense for power plants to be located so closely to a structure that a large amount of pedestrians will use. "Having a power plant with emissions right next to what’s supposed to be ... a walking path to Randall's Island doesn’t seem to be the right fit," Johnson said. The DEC did not respond to a request for comment. The plants are run by the New York Power Authority, and spokesman Paul DeMichele defended the agency's environmental practices. "The New York Power Authority adheres to strict environmental guidelines in the operation of its generation facilities, which are critical for the continued reliability of the state’s power grid," he said in a statement. "NYPA is committed to working with its host community sites to review their concerns." The DEC has already made a "tentative determination" to issue permit renewals to the plants, but the agency will determine whether or not to hold a public hearing for them based on the application and the comments it receives, according to the agency's website. Bubbins reeled off a host of issues he has with the plants, including air pollution and the fact that they are preventing the space from being used for recreation. He reiterated that the amount of opposition people had already shown of the plants should convince the DEC to discuss whether or not to issue the permit renewals. "We’re confident that they will be holding a public hearing on this matter," he said.